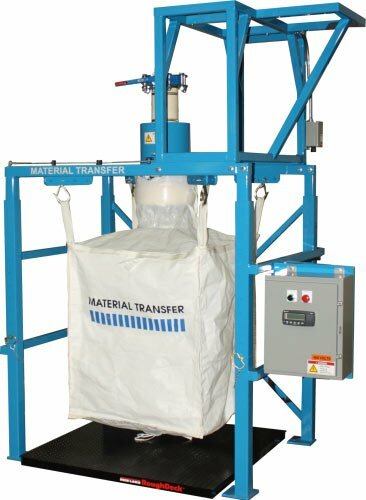 Unit is capable of handling bulk bags up to 5,000 lbs. All welds are continuous with no pits or pockets, product contact welds are polished smooth. Carbon steel fill tube with 6” diameter inlet stub. Upper carbon steel support structure for mounting custom vacuum conveying system (not shown) with conical outlet hopper and a 6” diameter manual butterfly valve. Fill head includes dust control inner liner with 4” dust take-off stub. Food grade inflatable spout seal assures a dust-tight seal to bag inlet. Bag hanger system can be quickly adjusted to fit a wide range of bulk bag footprints. Manual, snap action, bag strap attachment and release. Gain-in-weight carbon steel scale system (5,000 lb. capacity) with digital weight indicator. Controls housed in a carbon steel NEMA 4 enclosure. Unit is sand blasted, cleaned, and painted MTS Blue using an industrial PPG DTM Durethane finishing system.